The South Shore of Lake Tahoe is a land of many uses and stretches from Emerald Bay to Spooner Lake. Lake Tahoe has the largest number of Alpine ski resorts in any one area of North America, a total of 15, and 3 of those resorts are on the South Shore; Heavenly, Kirkwood and Sierra-at-Tahoe. There are also several outstanding cross-country ski areas, including Camp Richardson, where skiers can stride along the shore of Lake Tahoe. You can also enjoy snowmobiling from the crest of Hwy 50 at Sooner Lake, offering spectacular panoramas. Some of the finest mountain hiking trails in the Sierra, such as Horseshoe Falls, are just over the Western Slope where the trail takes you up to the magnificent Desolation Wilderness. Biking on mountain trails offer easy pedaling or demanding pumping. Also, year-round horseback riding will take you to back country where trails are historic and challenging. Historically, the South Shore was home to the Washoe Indian Tribe, who came to the South Shore in the summer to enjoy the cool weather, the excellent fishing and to gather flowers and plants that were used as medicine. The Washoe called the lake “Da ow a ga” or Lake of the Sky. Faulty translation resulted in “Tahoe”. The Washoe would camp in a meadow bordering the edge of what is now Stateline, across from the Lakeside Inn where Tahoe’s first airport was built. The meadow is still there, preserved by a gift to the National Forest Service as the Lam Watah Trail, which leads from Hwy 50 to the Nevada Beach through open land, across creeks and between rising hillocks of giant boulders. The discovery of the Comstock Lode some 25 miles away at Virginia City and the clear-cutting of the basin’s forests resulted in the Washoe giving up their annual visits to the lake. The Comstock Lode discovery and the urgent need of timber to shore up the mines denuded much of the Basin, but some of the South Shore forests were left intact simply because it was to difficult to get the timber out of the Basin and on to Virginia City. 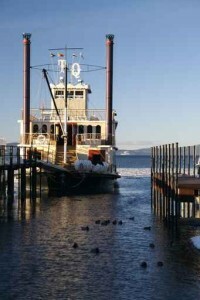 Although the Washoe no longer visit the lake on an annual basis, a summit meeting in the summer of 1997 with President Clinton, Vice President Gore and local officials resulted in the return of land around the lake to the Washoe for future settlement and construction of an Indian visitor center. The modern era at Lake Tahoe’s South Shore began when explorer John Fremont climbed a ridge trail from the Carson Valley and became the first European to see Lake Tahoe. That ridge and the Fremont camp site is now part of a hiking trail that starts at the top of the Tram at Heavenly Ski Resort and is probably one of the most popular short hikes around the Tahoe Basin. By 1895, most of the timber was gone and the Comstock was beginning to run thin. The South Shore slipped out of view for a few years until lumber tycoons Duane L. Bliss built a narrow-gauge railroad from Truckee near the Donner Pass to shore side Tahoe City. The rail line suddenly made visits to the lake easier, and soon many luxury steamships were taking visitors around the lake in comfort. 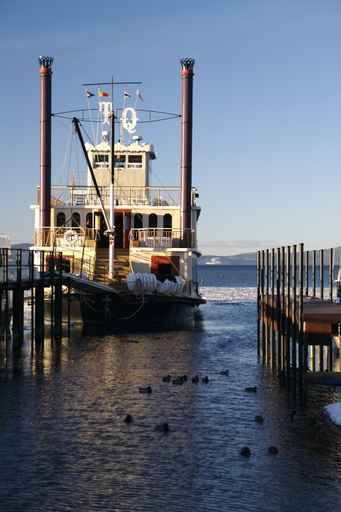 That tradition today is carried on by the Tahoe Queen and MS Dixie II, which offer lake tours. In 1931, engineers blasted two tunnels through Cave Rock near the eastern extremity of the South Shore, completing the road around the lake and ending the era of the luxury excursions and the narrow gauge railway. Today, South Lake Tahoe is the home to approximately 24,000 hard-working, outdoor-loving citizens, who enjoy all the usual pleasures of small-town ambience while having the Sierra as their backyard. South Lake Tahoe is also home to five major casinos offering gaming and entertainment: Harvey’s, Harrah’s, the Horizon, Caesars and the Lakeside Inn. The showrooms present major entertainment and dining in sky top restaurants that offer spectacular views and outstanding international cuisine. Whether you like the summer activities of hiking, biking, and sailing, or the winter activities of skiing, cross-country, and snowmobiling, or perhaps a combination of both, there is something here in Tahoe for everyone. "“Michelle Cutting’s communication and responsiveness was excellent. Every question was answered in a timely manner. When we came up for our ‘walk through’ she had touched up several of the walls... continued"